Wondering how old your little budgie is? 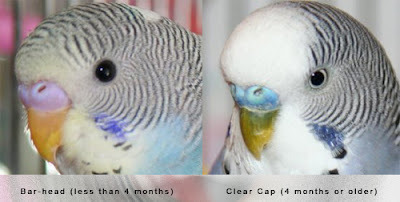 1) CAP FEATHERS - In most varieties, young budgies will have bars on their head all the way down to the cere. At about 3-4 months of age, a budgie will go through its first molt, and the top feathers on the head will be replaced and will no longer be striped. So a budgie with stripes down to the cere has not gone through its first molt and is less than 3-4 months old. A budgie with a white or yellow cap (depending on color variety) has gone through its first molt and is therefore older than 3-4 months. Lutino/ Albino, Recessive Pied - These varieties do not have normal feather markings and therefore this age test cannot be applied to them. 2) EYES - In most varieties, young budgies' eyes will be all black. As they get older, the iris gradually lightens to very light grey/brown. A budgie with a completely black eye is probably under 4 months old. A budgie with a dark grey iris is probably 4-8 months old. A budgie with a light grey or brown iris is probably older than 8 months. Lutino/Albino, Lacewing, Fallow - At all ages these red-eyed varieties always have a light colored (pink) iris. Recessive Pied, Dark-Eyed Clear - These varieties always have dark plum eyes which do not change with age.